1. Alhaji Sani Dododo was appointed by NWC headed by Chief Oyegun as Chairman. And whoever can appoint can also sack. The NWC has not at any point disown Chief Oyegun's powers to act on behalf of the NWC. 2. Ogboru and his co-travellers are yet to display a formal letter of appointment, if any, ever issued to Alh Dododo, if indeed any exist. Alh Dododo could not keep his job long enough to be issued any appointment letter. If he has one we challenge him to display it. 3. Alh Dododo was quickly procured by Ogboru/Agege and Prophet Jones Erue even before he arrived Asaba. He quickly declared 100 packets of results sheets missing in preparation for Ogboru/Agege using them to return fake results back to him. 4. Out of his 6 man committee team, 5 members including the Secretary soon found out Chairman Dododo has sold out the wards congresses to Ogboru/Agege. They reported their findings to APC national which advised them to act to ensure the integrity of the wards congresses is not compromised. They then move location in order to collate the authentic results of the congresses that they have duly received. 5. Realising the next morning that the rug has been pulled off his feet and he has no value to deliver to his employers, Alh Dododo paniced and in desperation, found in conjunction with Ogboru/Agege a new plot to attempt to criminalize the honourable decision of his 5 members to abandon him and his sell out scheme. To this end he sought the services of the Police and DSS where he first reported that his 5 colleagues where indeed kidnapped. 6. Even when his 5 integrity colleagues called in to the Commissioner of Police to say they are well and okay but fully engaged in completing their assignment at an undisclosed location, Alh Dododo ensured he got a vague and pointless police report from the Police meant to be used by his paymasters as a blackmail tool. 7. Unknown to Dododo and his trio of Congress riggers, the 5 man team has been keeping the APC national headquarters abreast of developments and have received instructions to carry on with their majority assignment. 8. Ogboru/Agege/Jones compounded Dododo's predicament when they push him to announce on live television on Sunday May 6 2018 their hurriedly assembled fake results to the shock and embarrassment of APC national! Alh Dododo then went on record as the only Congress Chairman out of the 36 states and FCT that announced such results. In the so-called results he so announced, the photocopied results sheets initialed by Dododo in replacement of the 100 booklets he claimed were missing and specifically deployed for use only in Delta North did not return! The question is, how did Dododo get complete results for use for the 270 wards in Delta when the 5 man team has already received and commenced the collation of the results returned from the 270 wards. The answer lies in the 100 purportedly missing booklets. 9. On Monday May 7, the Wards Appeal committee came to Asaba and received the congresses results and report of the 5 man team, after which the team proceeded to Abuja and submitted same to the NWC. Meanwhile, not having any credible results/ report to present, the one man Chairman/Committee ran along with Ogboru/Agege/Jones to Abuja APC office. Upon been rebuffed at APC Abuja, they became frenetic in search of the Appeal panel that has completed their work and reported back to APC headquarters. As reported by the media, this group allegedly tried and failed to compromise the appeal panel not just to accept their results but to withdraw the earlier approval the panel has given to the results submitted by the 5 man team of the congresses committee. 10. On May 9 2018, the NWC through the National Chairman sacked Alh Dododo for gross misconduct and acting outside the guidelines of the congresses. Alh Dododo who has not at this time being issued any appointment letter did not require a formal letter of disengagement issued to him. He was promptly informed of his disengagement. A new Chairman Hon Emmanuel Chindah was immediately appointed by the NWC and issued a letter that incorporated the other 5 members who delivered their assignment to the satisfaction of the NWC. 11. On May 10, 2018, an introduction letter was issued and directed to the Police Commissioner in Delta State informing and requesting for security coverage for the new Chairman and the Secretary and other committee members for the duration of their conducting the LGA Congresses on Saturday 12th, May 2018. This letter was copied to the DSS. A similar letter was sent to INEC head office Abuja with copy to INEC Delta State. These letters to Police effectively took the wind of the purported police report procured by Dododo in connivance with Ogboru/Agege for the purpose of hounding, intimidating and blackmailing the other 5 members of the committee. It is obvious to all and including the Police and the DSS at this point that the 5 members acted honorably and are exonerated and Alh Dododo was the criminal after all. 12. Earlier on and in another failed attempt to breathe life into their dead wards exco results that have been rejected by NWC and the Appeal panel, the Ogboru/Agege/Jones trio had gone ahead to fish out the 7th member of the committee that never ever showed up and never was in Delta for the wards congresses, and procured him to sign the fake wards results alongside Dododo to give the fraudulent impression that Dododo has another member in agreement with him. What a low level for desperados! 13. But what did the Ogboru/Agege/Jones do next? They retained the services of the disgraced and sacked Dododo parading him as still the substantive Chairman of the Delta State APC Congresses committee! 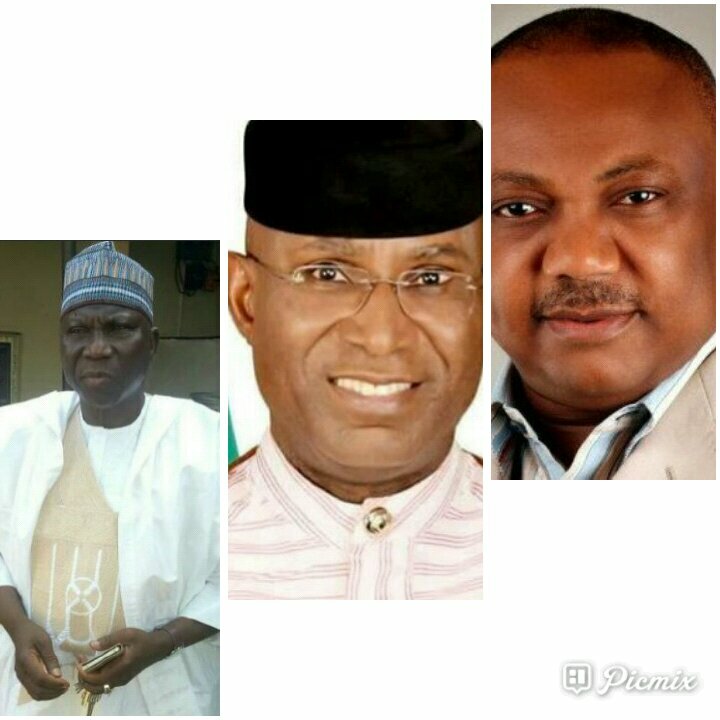 And in a show of bravado akin to the NASS Mace saga, the Ogboru/Agege/Jones trio marched Dododo almost like a hostage, to the media centre of the national APC headquarters Abuja yesterday May 14, 2018 to announce again on live television that he singularly as Chairman and only committee member succeeded in conducting a parallel LGAs congresses in Delta and he is there to submit the results to the NWC that has earlier sacked him! Incredulous! And there were Ogboru/Agege/Jones standing gleefully behind him, as if they are his committee members, staring at the AIT cameras! Is there no morality or shame in the world anymore? How else do you discribe this, madness? 14. And precisely at the same time when this show of shame was going on in Abuja, the new and authentic Chairman, Secretary and members of the wards and Lga congresses committee where at the APC Secretariat Asaba handing over the results and report of the LGAs congresses they undertook one Saturday 12th 2018 under the supervision of the police, DSS and INEC to the Appeal panel that has arrived from Abuja to commence sitting in Asaba starting from Tuesday May 15th. 15. What on earth can drive people to this level of DESPERATION! WHO IS THE JOKE ON AT THIS POINT? OYEGUN OR OGBORU/AGEGE/JONES? Your guess is as good as mine!